If you are tired of solving moisture and water problems, you should consider using concrete waterproofing products that have been tested and found to guarantee the required protection. GSG Distribution provides various solutions used for this purpose. Our water-based formulas penetrate through the concrete and fill all the capillaries found in the slab and provide an effective barrier within the concrete. When this happens, it results in a permanent waterproof barrier that protects all the coverings from water and moisture damage. Large property investments are a serious matter. 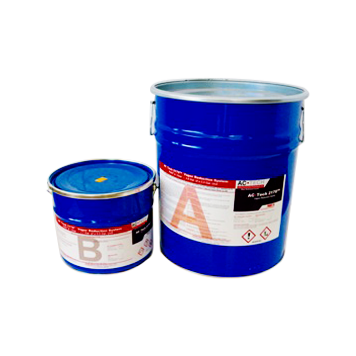 As such, it is necessary that the investment is protected from adverse weather effects using concrete floor waterproofing products. This will not just protect your building from the ingress of moisture but will make it strong. Buying quality products from reputable companies is important because it guarantees maximum protection for your building. Generally, moisture will enter the building in many forms. This is why it is important that you plan ahead on how to deal with it using recommended products – such as sealants. The products chosen should ensure that you have a control of the moisture migration into your property. Treat the entire ground surface adjacent to the building so that you direct the water away from your structures. Note that it is important you do this in the right manner since you may not get an opportunity to do it another time. If you don’t, it may be very expensive to have it done once the building has been completed. Remember, a leaky foundation can damage your structure or ruin the furnishing and finishes. If you are going to use the building for commercial purposes, leaky foundations and slabs can ruin expensive equipment and could easily disrupt vital work and lead to wasted time, lost money and upset your clients. In some severe cases, it can lead to litigation. Also, damp concrete can create a stale odor, cause mildew & mold to grow and ruin your carpet or equipment in your garages. This is why it is advisable that you use recommended concrete floor waterproofing products and seal the concrete with concrete protection products so as to eliminate any kind of dampness, which may ruin your equipment and furniture. 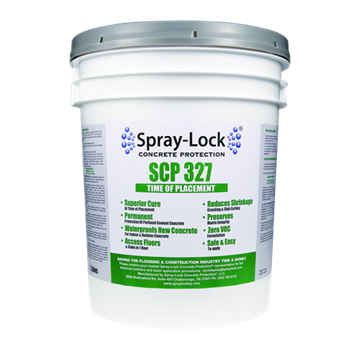 These concrete issues and more can be handled with Spray-Lock Concrete Protection SCP 327. Applying it at time of placement will prevent moisture and alkalinity problems in your concrete slab. In addition to minimizing problems such as slab curl and shrinkage cracking, SCP 327 also eliminates expensive remediation down the road. Your flooring can be installed in as little as two weeks after the concrete has been placed with no moisture-related problems.